Everyday headlines about bike accidents are in my newsreader. That doesn’t make for an upbeat, positive blog to post all of them, but I’m certainly aware of the trends and the deaths. 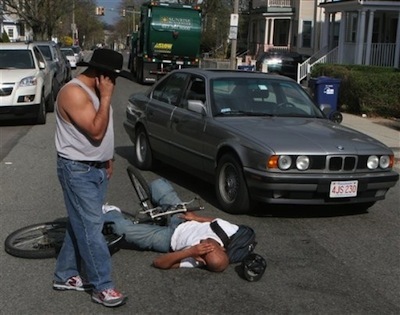 This photo from the AP is a reminder of the somber fact that cyclists and cars collide. Photo from AP Photo via Daylife. It’s not always the driver’s fault either. Accidents happen and too often. We forget at times how dangerous what we do is and the challenge for cycling, as a whole, is to make it safer.